First-day 2 office on bicycle. - GGI-Group size: 4000+ Professionals, Increasing on day to day basis, Come & join us 2 serve Mother Nature. 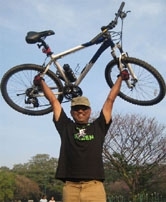 Tuesday 2nd September 2008 was a good day (Gowari festival) I started of my cycling It was not a easy job as I thought but yes a memorable experience and worth while to experience for a better cause. The total distance that I need to cover was around 9.5 Kms (JP Nagar 5th Phase to Begur Road Bomanahalli) started off by 7:00 am as planned, I covered around 7.5 Kms within 20 Minutes (Avoiding all the main roads) and reached Silk board but surprised to see the same amount of traffic @ this hour too (7:20am) mainly consisting of Call center CABS and IT buses but as usual every one where honking their horn when they see a cyclist in front of them however I had planned to carry a message behind my T-Shirt saying “For a better tomorrow…. 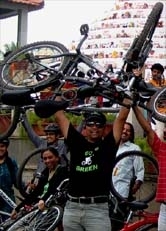 Go Green, I am going… How about u ??? “ one gentle man who was driving a Toyota Corolla, coming back of me, put his window glass down and gave me a Thumbs Up.. I felt very happy. 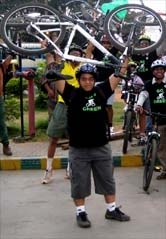 I am confident of successfully spreading the Go Green message to all the commuters on our Bangalore roads and my colleagues too.. I have reached the office within 35 minute, usually it takes 50 to 70 Min (minimum) when I use my Car.